Harry Devlin is a duty solicitor in central Liverpool. Since his wife, Liz, left him he leads a solitary life, his time revolving around work and representing petty criminals during interviews and in court. It’s definitely not the glamorous side of legal work and nor does it pay handsomely. Arriving home late at night he finds his former wife waiting in his apartment. Always the life and soul of a party, she’d left him for a well connected criminal. Harry has never stopped loving her and when she asks if she can stay for a few days whilst she sorts out her personal life he agrees against his better judgement. Within twenty four hours she is dead, stabbed to death in an alley. Rather than leave the case to the police, Harry decides he’s going to catch his ex-wife’s killer. He starts to follow up on leads, but it’s clear that neither the police nor the perpetrator are happy with his crusade. Regardless, he persists with his investigation, whilst at the same time fending off the advances of his lonely neighbour. 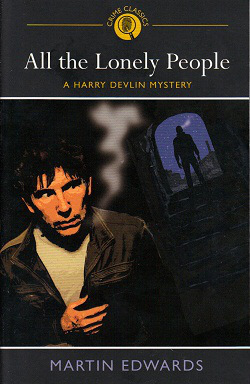 All the Lonely People was Martin Edwards debut novel and the first book in an eight part series featuring world weary but tenacious solicitor, Harry Devlin. The story has the feel of a classical who-dunnit, with Devlin taking on the role of a put-upon, down at heel PI, and the tale focusing on the characters, their relationships, and the investigation, but with little gore or unrealistic or heightened tension. Edwards does a nice job of contextualising Harry’s life as a duty solicitor, evoking Liverpool at the end of the 1980s, and capturing the lives of the poorest strata of society and their social relations. The characterisation is nicely observed, as is the interplay between the characters. For the most part the story works well, but the puzzle seemed a bit too weak and the killer well signposted, in part because the misdirection was a little too obvious. Nonetheless, I found it an entertaining read and hope to spend some more time in Harry’s company in the future. Rob - I'm glad you liked this novel. I like Harry Davlin very much as a character, and I do like the Liverpool setting. I'll be interested to see what you think of the other novels in the series if you get to them. I read this a little while ago and agree with you that it's a workmanlike but ultimately weak effort. This was the first book by Martin Edwards I read and I liked both the plot and the character of Harry Devlin and the manner in which he searches for the man who killed his estranged wife. Doesn't do a lot to grab me. Probably one to skip. Thanks for the info.